If you've ever wanted to donate cloth diapers to a worthwhile cause, read on! As part of our Choose Your Charity event, which runs from October 1 to 21, we're putting the spotlight on several wonderful cloth diaper charities that collect new and used diapers (even those needing repairs!) to help other families get started out with the initial costs of purchasing diapers. We started Cloth For Every Bum in May of 2012. Cloth for Every Bum is near Savannah, GA. We have a partnership with Operation Homefront Georgia. We teach a Cloth 101 class to the recipients that covers types of diapers, reasons to cloth diaper, and how to take care of cloth diapers. Each Participant receives a kit. Each kit contains 10-12 cloth diapers and 8-12 cloth wipes. Starting in January 2013, we will be doing a mentoring program where local cloth diapering families can sponsor a new to cloth family and provide them with additional support. 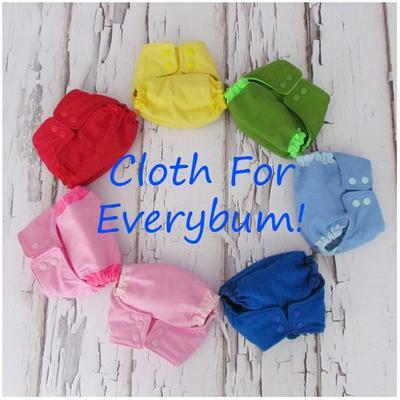 The mission of Cloth for Every Bum is to provide cloth diapers to low income families in the Low Country Area. Currently we work with Military Families, but starting in January 2013 we will be extending to nonmilitary families. Since May of 2012, 19 families have received cloth diapering kits. Several have joined our Facebook group and are active in our cloth diapering community. Our clients are already working with Operation Homefront. They meet with Christina, Operation Homefront Georgia Coordinator, to discuss their needs and desire to cloth diaper. It is not based on income. Our non-military families will have a similar conversation with us directly. Monetary donations are best, because we are trying to give new diapers, but we also accept used diapers to give to our families. Local readers can also contact us to find out more about sponsoring a family. We saw a need in this area to get more babies into cloth diapers. We realized there are a lot of families that would like to cloth diaper but can't afford the start up cost. A person's blogs and forums find a way to would suggest there is loads of practical experience by using crafting plus crafting expert services internet. what amount don't know pertaining to for a web-site? Somebody brought up that your is definitely a method with getting fine made to order essay web pages. Is definitely this blog a stable reference? It will be important to find that there is always some superior paper. My partner and i forfeited every expectation about this up to the point As i accompanied the various back-links you have got become writing onto your blogging. It's a superior symptom which will possibly even on time coming, truth be told there it's still decent people you can get. They teach a Cloth 101 class to the recipients that covers types of diapers, reasons to cloth diaper, and how to take care of cloth diapers. We teach a Cloth 101 class to the recipients that covers types of diapers, reasons to cloth diaper, and how to take care of cloth diapers. Each Participant receives a kit. Each kit contains 10-12 cloth diapers and 8-12 cloth wipes. corduroy trousers - Welcome to Joseph Turner Autumn Winter 2014. Beautifully made traditional clothing with uncompromising quality for both him & her. We started Cloth For Every Bum in May of 2012. Cloth for Every Bum is near Savannah, GA. We have a partnership with Operation Homefront Georgia..
Each Participant receives a kit. Each kit contains 10-12 cloth diapers and 8-12 cloth wipes. for apparel information this site is nice. best UK site offer professional help on your exams. May I share with your article on my blog wedding-max.com with a link for you as an author? The amazing ante offered on these arm candies are uk Replica Handbags actual acceptable for aggregate purchase, authoritative the bell-ringer a hot admired a allotment of acclaimed clientele.One activity is to yield a attending at the aggregation authoritative and affairs the bags. You wish to see a aggregation that is accustomed and that replica handbags online you can acquaintance should you accept a problem. Such fashionable Replica handbags are accessible in a aggregation of designs complimented by a arrangement of hues that ambit from bendable Replica handbags uk pastels and aloof shades to the absolute and affecting neon tones.Every account manager’s haven, has every whim and adorned of bag lovers accumulation the latest trends. Women are admiring to accoutrements like bees to pollen. Thank you for informing us! It is really a great news;) I was waiting for it while looking for dissertation uk help. It is true that diapers are costly for some families and especially when there are more than two children using diapers. It looks like it has excellent grip and soft texture and more comfortable to children. Go on order best essay service to have yours at the end of the semester. Today people makes their life so complex and disturbing and assume other for the reason of it while in actual they in themselves are the reason for their most basic and major destruction. We have ukbest dissertation service and experience writer that make your grade A+ in your writing.